When you're feeling bold and adventurous, try some eye makeup ideas to stand out in the crowd. Apply a coat of powder foundation on your eyelids. Add white eye shadow, blending from lash line to brow bone. Line your eyelids with liquid liner, starting at the inner corner and ending at the outer corner, making the line slightly thicker along the outer half of the eye. Apply blue or green eye shadow from lash line to crease. Add some black eye shadow at the outer corner, blending into the crease. For that dramatic 1960s look, add extra-long false eyelashes, and apply several coats of black mascara to both top and bottom lashes. Make sure your eyes are the focal point of your look by keeping the rest of your face pale. For characteristic pale 1960s lips, apply some foundation to your lips, and then some white eye shadow, and finally some loose powder to seal. Apply an eye shadow primer on the lid, from lash line up to the crease. Brush lime green eye shadow on the inner half of the eyelid and bright blue on the outer half, from lash line to crease. Using a fluffy eye shadow brush, blend the two shades together slightly. 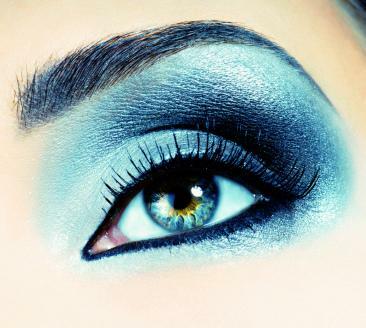 Apply some of the bright blue shadow under the lower lashes with a fine liner brush. Press some yellow eye shadow into the recess at the inner corner of each eye. "Tight line" your eyes with black liquid liner by laying the wand parallel to your lower lash line at the inner corner, closing your eye so that both lids are touching the wand, and quickly dragging it across to the outer corner of the eye. It takes a little practice, but the professional effect achieved is worth the effort. Apply several coats of black mascara to finish the look. Apply a foundation base to your eyelids. Add a thin line of kohl liner pencil along top and bottom lash lines, extending a little past the outer corner, and smudge the lines to soften. Smudge some dark eye shadow on the outer half of each lid (top and bottom), blending along the line that extends beyond the corner of each eye. Add some bright eye shadow above the dark shade in the outer half of each eye, blending upward to brow bone, letting the lightest shade show at the inner corners. Finish with bright blue or purple mascara. Whether you're going out to a nightclub for the evening or are just feeling like doing your eye makeup a little different for daytime, trying one of these funky eye makeup ideas can lift your mood and keep you out of an eye makeup rut.